It’s the time of year when university teachers exchange stories about amusing or alarming mistakes made by students in their examination answers. I always feel that to some extent examinations are a test of the teachers responsible as much as of the students being examined. So it was with some sense of dismayed guilt that I saw that one of our master’s students thought that bubbly was a good example of geminated [bb] and that another thought that battle and bubble end in the fricatives [ɬ] and [ɮ] respectively (or, as yet another student put it, ‘respectfully’). Didn’t I teach them properly? I hope these were just silly slips made by having to write fast under examination pressure, but I can’t help wondering whether the perpetrators really believed that what they wrote was correct. Non-specialists, and beginners in phonetics, are often confused about sounds and letters. They readily think of a word as consisting of a string of letters, but find it difficult to think of it as consisting of a string of sounds. They say things like “he can’t pronounce the letter r properly”. In our beginners’ classes we have to insist that speech consists of sounds that can be heard, whereas writing consists of letters that can be seen. If you can see it, it’s a letter (or perhaps a symbol or a character), but not a sound; if you can hear it, it’s a sound (or a phonetic segment or a phone or a prosodic feature or even for some people a phoneme), but not a letter. Writing is what you can see, speech is what you can hear. The confusion usually involves using ‘letter’ instead of ‘sound’. But I have also come across the converse: referring to ‘sounds’ when what is meant is letters, written symbols. The guilty party is once again Helen Gilhooley in her Teach Yourself Beginner’s Japanese Script (Hodder, 2003) (which, I must emphasize, is otherwise an excellent book). Discussing how foreign names and loanwords are represented in the Japanese katakana writing system, she says (p 137) “There also exists a group of sounds which have been designed to represent v sounds: ヴァ (va), ヴィ (vi), ヴ (vu), ヴェ (ve), ヴォ vo).” She is obviously referring to a group of written kana characters (symbols). What do you call the punctuation mark “-”, as in re-enter? I have always called it a hyphen. So I was surprised when about twenty years I started to hear native-English-speaking undergraduates refer to it as a ‘dash’. My reaction was that this was a simple error, and if they did it in writing I corrected them. A dash, for me, is the similar but longer sign ‘—’. This was the terminology I was taught at school—and this is the usage of professional typographers and indeed phoneticians. After all, Daniel Jones’s 1955 article (Zeitschrift für Phonetik 9) was entitled ‘The hyphen as a phonetic sign’, not ‘The dash as a phonetic sign’. MS Word’s AutoCorrect options include “Replace hyphens (--) with dash (—)”. This and other word-processing software usually includes a hyphenation function that can be toggled on or off. The distinction between ‘hyphen’ and ‘dash’ is a useful one. You may have noticed that a dash (-) is used between the number and the word for the month (gatsu) for example ichi-gatsu. In the same way, a dash was placed between country and person (Amerika-jin), country and language (Furansu-go) and in counting numbers, between 10s and units (11 = jū-ichi). This is to help you at first to see how the new word is made up of two words. For example, Doitsu-go (German) is made from Doitsu (Germany) and go (language). However—as you can see from the above excerpt, reproduced exactly as printed—punctuation is in any case not Ms Gilhooly’s strong point. em dash (—), the same width as the letter m, and others. Another issue is that of whether the dash ought to be surrounded by spaces — like this — or not (as a few lines above), when used to make a break in the flow of a sentence. I’m happy to go either way on that one. We do not allow research students at UCL to register directly for the PhD. Instead, they have to register first for the MPhil. Then, if all goes well, after eighteen months or so they can apply to be upgraded to PhD registration (see here, scroll down). For this upgrade to be granted they have to submit a written document (an outline of the intended dissertation, with a sample chapter or two) and be examined on it by a panel of examiners from the Department. From the candidate’s point of view, this can be a considerable ordeal, but is good practice for the real thing, the PhD viva. I am delighted to report that my student Joe-Eun Kim passed her upgrade panel yesterday (subject to certain conditions). Her work concerns the pronunciation of English by native speakers of Korean. One of the things she has done is to confirm very clearly that the old simplistic model of contrastive analysis is not adequate to predict the pronunciation errors language learners make. For example, in both Japanese and Korean there is just a single liquid phoneme corresponding to the two liquids, /r/ and /l/, of English. Contrastive analysis predicts that both Japanese and Koreans would have problems perceiving and producing the English /r - l/ contrast. As we all know, this is true for Japanese learners of EFL. Yet it is not true of Koreans, who can generally perceive and make the difference perfectly well. The explanation clearly lies in the fact that the Korean liquid (orthographic ᆯ, for those of you who have the relevant font) has both lateral and tap allophones, [l] (or perhaps [ɭ]), used finally and preconsonantally, and [ɾ], used intervocalically. This provides a sufficient basis for Korean learners of EFL to cope. In the performance test of the MA Phonetics practical the candidates have to produce various sound-types to order. Instead of the examiner giving them a phonetic symbol or symbols and asking them to pronounce the corresponding sound(s), as happens in lower-level phonetics practicals, it proceeds typically as follows. Yesterday our MA Phonetics students had their practical tests: transcription, dictation, and oral (performance and recognition). A	 Oh, hi there! I was wondering if I could have a word with you. B	 Yes, of course. What is it? A	 It's about that Birmingham job I mentioned. I've finally decided to go ahead and apply for it. B	 Well, good luck then. But what d'you want me to do about it? A	 I was hoping you might give me a reference, or at least put in a good word for me. B	 OK. You'll have to tell me what you want me to say, though. I'm not very well informed about your career to date, you know. A	 Oh, I'll cover all that in my c.v. What I need from you is more a character reference, saying that I'm trustworthy and honest and so on. B	 All right, then. Give my name to the recruitment agency and get them to write to me. I hope you get the job, though of course I'll be sad to see you go. Most of our students (none of whom are native speakers this year) did pretty well on this exercise. Nevertheless it is instructive to analyse the most frequent errors they made. Words frequently transcribed wrongly: then as /ðən/ instead of /ðen/ (this word has no weak form); trustworthy with /θ/ instead of /ð/. I didn’t penalize Birmingham with /‑ŋɡ-/, given that that is how the locals pronounce it. I also allowed of course with /əf/ instead of /əv/, although the latter is surely the usual form, voicing assimilation across a word boundary being unusual. In the intonation mark-up, the most frequent errors were a failure to identify compound stress in ˈBirmingham job, ˈcharacter reference, reˈcruitment agency; failure to accent ahead; failure to deaccent I mentioned and you know. Only three of the eight candidates managed to locate the nucleus correctly in what is it; only two got the most plausible nucleus placement in what d’you want me to do about it. Every now and again my students reveal that they are confused about the words precede and proceed. Accounts of phonetic processes and allophonic rules often refer to a preceding consonant, being preceded by a vowel, and so on. In the sequence ABC, B precedes C and is preceded by A. But students sometimes write this as a ‘proceeding’ consonant, or being ‘proceeded’ by a vowel. Worse, since to proceed from can mean to follow, they sometimes interpret my spoken precede, which they imagine to be proceed, as meaning ‘follow’, so that they also have the meaning the wrong way round. In theory, the distinction between the [ɪ] of precede and the [ə] (weakened from [əʊ]) of proceed ought to be robust. After all, in my own speech and in that of most of my students valid doesn’t rhyme with salad nor rabbit with abbot; the initial syllables of finesse and phonetics differ. But in practice, clearly it may not be: weak pre- and pro- can get confused. And I have just detected one of my favourite authors, Jared Diamond, committing the reverse mistake. In his marvellous book Collapse (Penguin 2006), on page 501 of the UK paperback edition, we read that “LA smog generally [gets] worse as one precedes inland”. Oh dear. What a precedent. As part of the phonetic workshop I conducted at the University of Kōchi last week there was a question-and-answer session. There were seventy or eighty people in the audience, a mixture of students and schoolteachers, with a sprinkling of academics, and we asked them to submit their questions in writing, giving plenty of advance warning. The result was a surprisingly large number of questions, which ranged from the narrowly phonetic (“What is the difference between ˈsʌdn̩li and ˈsʌdənli?”) to the general and personal (“Do you speak Japanese?”, “How many people do you have in your family?”). The question about the transcription of suddenly gave me an opportunity to talk briefly about nasal release and also about the abbreviatory convention I use in the Longman Pronunciation Dictionary, where the word is transcribed ˈsʌd ən li. Japanese learners of English find nasal release very difficult. (They find lateral release even more difficult, for obvious reasons.) The Japanese version of Sydney is シドニー (shidonii — you won’t be able to see the Japanese writing on your screen unless you have an appropriate font installed); for them to pronounce it as two syllables, with nothing between the [d] and the [n], [ˈsɪdni], presents a real problem. Although I know a few words and phrases, and have plenty of theoretical and practical knowledge about Japanese pronunciation, the answer to whether I speak Japanese is a regretful “No”. There will be another interruption to this blog now, since I’m off to Japan, where I shall be giving lectures or workshops in Osaka (Kansai Gaidai), Kōchi (U. of Kochi), and Tokyo (Seitoku U., Matsudo). Back in ten days’ time. More oral examining on Tuesday, this time of BSc Speech Sciences students. Despite what I said on 28 March, I have to admit that the standard wasn’t bad at all. In particular, the candidates had clearly all been working hard to learn the IPA symbols thoroughly. No one had a problem supplying VPM labels for ‘exotic’ consonants such as [ɣ, ɱ, ʋ]. Even [ɥ] was correctly identified, though not everyone could produce it acceptably. Another thing they are tested on is reading aloud short strings of phonetic symbols. Some of these are real English words — dɪˈnaɪ, ˈpɜːpəs and the like. Others look like English but are not, since they are not spellings but phonetic symbols, e.g. ˈreply, in which the last vowel is to be interpreted IPA-style as a close front rounded vowel; or thumb, where we need [t] followed by [h], a close back vowel, [m] and a final [b]. Candidates find these sequences remarkably difficult to perform correctly. It gets better. 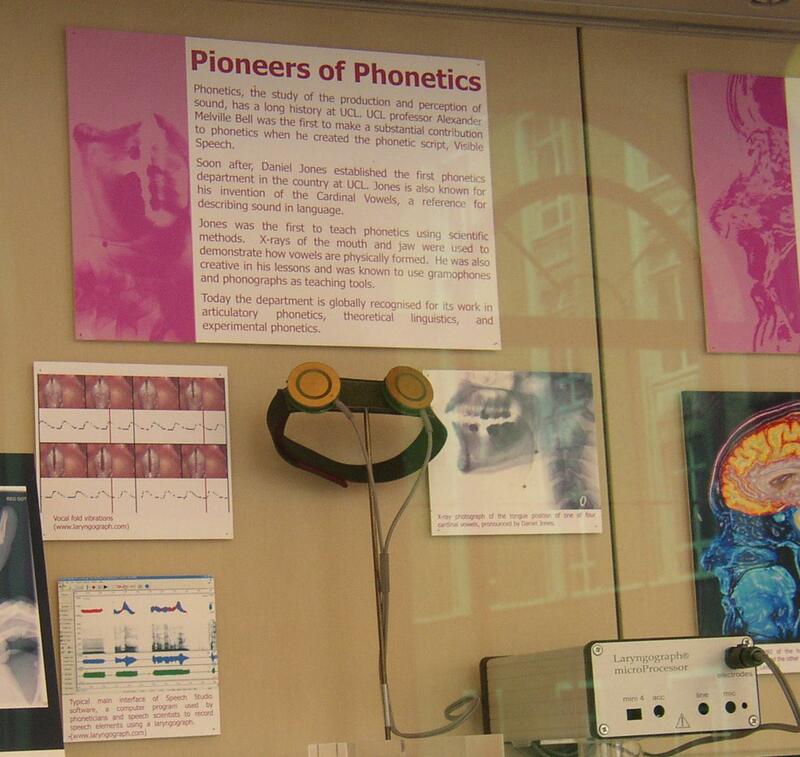 “From Bernard Katz’s discovery of synapses and Daniel Jones’ work with phonetics...” And indeed one of the displays is devoted to Pioneers of Phonetics (picture). 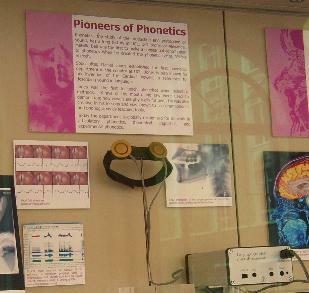 It shows views of the vocal folds, one of Jones’s x-rays of the organs of speech, a spectrogram and waveform, and a laryngograph complete with neckband electrodes. Like all phoneticians, I appreciate the work of the Christian missionary organization SIL (the Summer Institute of Linguistics) not only in training thousands of people in phonetics but also in supplying us all with free phonetic fonts for our computers. They currently offer a choice of three freely downloadable Unicode fonts, each covering all the symbols on the IPA Chart: Charis, Doulos, and Gentium. What do these names mean, and how should we pronounce them? Is the ch in Charis like the ch in eucharist, so that it is /ˈkærɪs/? Or is like in charity, making it /ˈtʃærɪs/? Charis is actually a Greek word, χάρις, meaning ‘grace’, and indeed is a part of the word that gave us eucharist, so my vote goes for /k-/. Doulos in Classical Greek (δοῦλος) means ‘slave, bondservant’. It later acquired a religious meaning: the Jesuits distinguished between dulia, veneration due to saints and angels, and latria, worship due to God alone. (The Virgin Mary merited hyperdulia.) Presumably we should pronounce it /ˈduːlɒs/. Gentium is the Latin genitive plural of gens, gentis, ‘race, nation, people’, so means ‘of the nations’. The question for us is whether to pronounce it with /g-/, as in the school pronunciation of Latin, or with /dʒ/, as in ecclesiastical or italianate Latin. Given the related gentile, I think we have to go for /ˈdʒentiəm/. This font was designed by Victor Gaultney, and started as his own project at the University of Reading; it was taken over by SIL in 2003. Earlier, non-Unicode, phonetic fonts available from SIL included Sophia and Manuscript. Sophia (σοφία) is the Greek for ‘wisdom’, as in philosophy, while Manuscript needs no explanation (Latin, ‘hand-written’). I saw an American TV programme recently based on the theme of the seven deadly sins. One of them is sloth, which the presenter pronounced /slɔθ/, to rhyme with cloth. But this is not my pronunciation: I call it /sləʊθ/, to rhyme with both and growth. The literal meaning of the name of both the deadly sin and the slow-moving animal named after it is “slowness”. The word is cognate with the adjective slow: as warm is to warmth, so slow is to sloth. There are some abstract nouns in -th that involve a vowel change when compared with the adjective they are based on: deep-depth, wide-width. But historically sloth was not one of them. Indeed, in earlier times it was sometimes spelt slowth or sloath. So the form rhyming with cloth must have originated as a spelling pronunciation based on the now current spelling, which according to the OED was first used in the sixteenth century. British dictionaries generally give only the pronunciation rhyming with growth. In LPD, for BrE, I do include the variant /slɒθ/, but with a ‘non-RP’ sign against it. But in AmE the pronunciation rhyming with cloth appears to predominate. I have been correcting the page proofs for my forthcoming book. It is a frustrating process. The way things work nowadays is that the author first submits his manuscript to the publishers in two formats simultaneously: as electronic word-processor files (a set of Word docs), and as hard copy (a print-out on paper). The first can be sent by email; the second, in my case, weighed several kilos, and I delivered it by hand. The publisher’s typesetters, in this case outsourced to India, convert the electronic file into XML (Extended Markup Language) form, which is similar to the HTML with which ones marks up a web page such as this. [I write this blog directly in HTML.] The typesetters generate a new mountain of paper, the XML printout, which comes to the author and to the publisher’s copy-editor for checking. This is meant to be the last opportunity for authorial and editorial corrections: for ironing out inconsistencies, correcting typos etc. The XML proofs correspond to the galley proofs of the old hot-metal era. The corrected XML printout then goes back to the typesetters for the corrections to be implemented. The design people work on it and generate page proofs, set out page by page as in the final printed book. And this is where the frustration begins. For some reason, neither the author nor the copy-editor actually modifies the electronic XML file. Rather, the copy-editor writes the agreed author’s corrections and her own in red ink on the paper XML printout. The Indian typesetters then have to implement these corrections. But in my case they frequently misread or misinterpreted the corrections. Why could the author and copy-editor not implement their corrections directly in the electronic file? The typesetters also introduced various new errors, particularly at page boundaries — presumably because they had inadvertently lost a few characters and then had to restore them (but restored them wrongly). Worse, the typesetters sporadically lost some of the text formatting. In my case, I make crucial use of superscripting and subscripting certain characters (writing them smaller, raised above or lowered below the line of writing, thus \, \). The superscripting/subscripting was in my original ms, and faithfully reproduced in the XML files. But in the page proofs some of it was lost. This means that I, as author, have to check carefully, character by character, and annotate each place where superscripting or subscripting is to be restored. The copy-editor has to transfer this information to her copy. And finally the culprits, the typsetters, will have to restore it to the electronic file. Do you think they will do so without introducing further errors? We shall see. I certainly hope that I shall have an opportunity to check again before the book is finally printed. If the typesetters had not carelessly lost these elements of formatting, this whole hassle would not arise. On the positive side, I am gratified that various Unicode-coded phonetic symbols, Greek letters and other special characters have all come out correctly. One more West Indian island whose name tends to be mispronounced by outsiders is Nevis. Properly, it is /ˈniːvɪs/. But those unfamiliar with the name often suppose that it is /ˈnevɪs/, like the Scottish mountain Ben Nevis. And then there’s Grenada, which is /grɪˈneɪdə/, not as some might think /grɪˈnɑːdə/. We won’t even start on Jamaican place names like Ocho Rios, in which the penultimate syllable was traditionally pronounced /‑ˈraɪ‑/, though this is now increasingly replaced by a Spanish-style /‑ˈriː‑/. Then there is the question of the pronunciation of the word Caribbean itself. The prevailing British stress pattern is /ˌkærɪˈbiːən/, but Americans generally prefer /kəˈrɪbiən/. “Anglophone Caribbean people say either one or the other or both, sometimes both in one sentence”, according to Jo-Anne Ferreira’s advice on the FAQ page of the Society for Caribbean Linguistics (scroll down to Part C), which I recommend for authentic local guidance on the pronunciation of West Indian names. Another West Indian island with a tricky pronunciation is Dominica. Locally, and locals would insist correctly, it is stressed on the penultimate: /ˌdɒmɪˈniːkə/. Those not familiar with the island tend to assume that it has antepenultimate stress, /dəˈmɪnɪkə/. Fans of Chomsky and Halle’s SPE will see that the disagreement relates to differing views about the length of the penultimate vowel: if long, then stress-attracting, but if short — as in Monica, Veronica, America, angelica and many others — then stress-repelling. Hence the adjective Dominican is ambiguous in writing. When spoken aloud, though, it ought to be unambiguous. If stressed on the penultimate, /ˌdɒmɪˈniːkən/, it properly refers to the Commonwealth island, while if stressed on the antepenultimate, /dəˈmɪnɪkən/, it refers to the Spanish-speaking republic — or, of course, to the monastic order. Thoughts on returning from abroad: if you fly with Virgin Atlantic or British Airways from London to Antigua in the West Indies, you find everyone from the check-in staff to the aircraft captain pronouncing it /�nˈtiːgə/, just as the locals do. But if you fly there from San Juan or New York on an American airline, as likely as not it will be referred to as /ɑːnˈtiːgwə/, with a Spanish pronunciation (sort of). Probably this is because Americans are much more likely than Brits to have learnt some Spanish at school, and of course the name does look Spanish and was originally Spanish, so that those unfamiliar with the name tend to assume it is Spanish, despite the island�s three and a half centuries of speaking nothing but English. The Brits, on the other hand, mostly have French as their main foreign language rather than Spanish (if indeed they know a foreign language at all), and perhaps anyhow retain some ancestral memory of how to pronounce the names of former colonies. You see something similar with jaguar. In the UK we anglicize it very thoroughly as /ˈdʒ�gjuə/, while the Americans are more likely to go for a Spanish-style /ˈdʒɑːgwər/. In Nicaragua, however, do I detect a slight movement in Britain away from the anglicized /ˌnɪkəˈr�gjuə/ in the direction of /‑ˈrɑːgwə/, as in American English?